Instant pot coconut rice recipe is so easy to make, quick and delicious which you can enjoy with any sides like curry, pickle or fresh yogurt as you like. 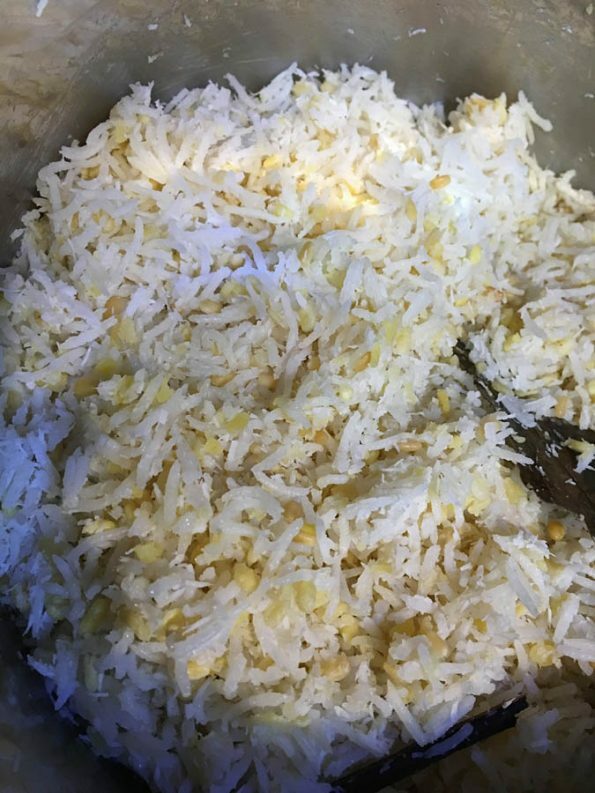 This is an instant pot coconut rice recipe is a simple South Indian style coconut rice recipe and it is made without coconut milk, as we use freshly grated coconut or dry shredded coconut (unsweetened) to make this easy coconut rice. See instant pot tomato rice recipe here which too is an easy, Indian style instant pot rice recipe. 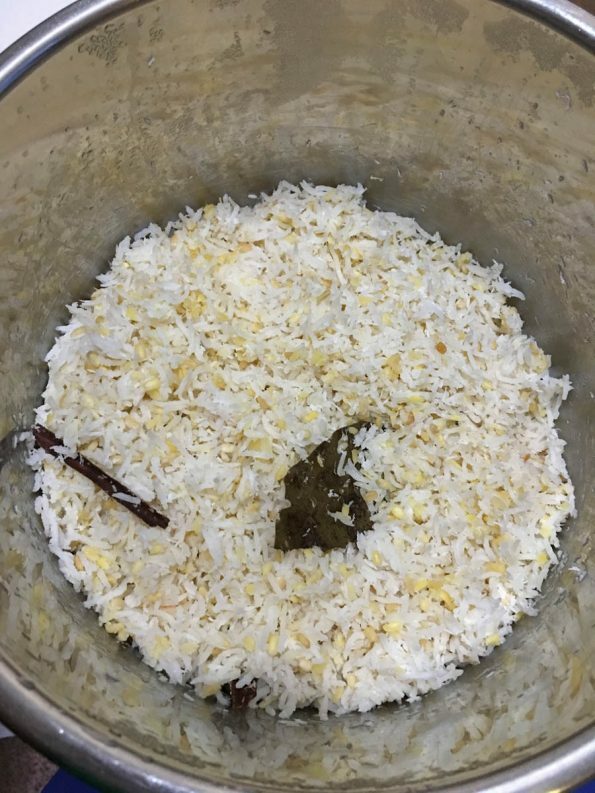 You can make this coconut rice using a 6 quart instant pot easily (you can also buy an additional 6 quart inner pot and other accessories for your instant pot easily online, for easy cooking!). Instant pot coconut rice is an easy Indian style pilaf or pulao which you can quickly make in the traditional way over stop, using a regular saucepan, pressure cooker or more easily using an instant pot! I used 6 quart instant pot to make this dish. I also added little yellow mung beans (yellow moong dal) for the protein, and it makes the rice even more delicious and nutritious, but if you do not want to add the dal you may skip it. If you do not use the dal, you will need to reduce the amount of water used for cooking to 2 cups instead of 2.5 cups as called in the recipe. I used whole spices like cardamom pods, cinnamon sticks, star anise, cloves and bay leaves to the rice which will add more fragrant and flavor to the rice without changing the color of the dish. 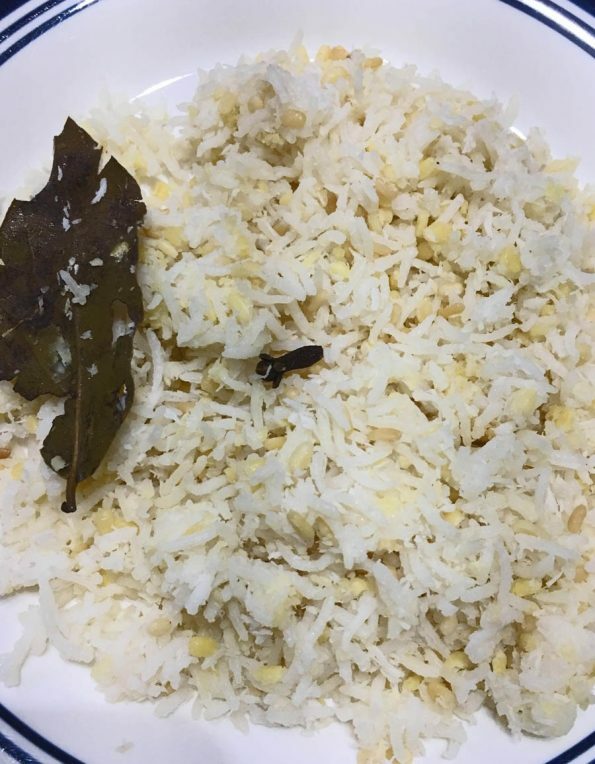 If you do not have any of these whole spices, you may use just the remaining ones, but using all the spices will give the best flavor for this instant pot coconut rice. 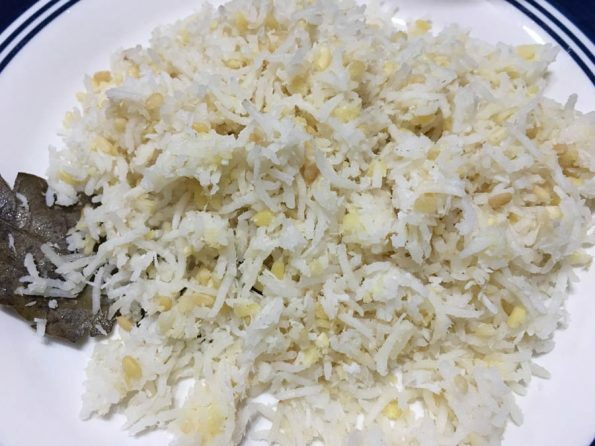 There is not sauteing or light frying involved in this instant pot coconut recipe, and basically you dump all ingredients to the instant pot and let it do the cooking, so this instant pot coconut recipe is so easy to follow and you can have easy and quick coconut rice for dinner with minimal efforts. 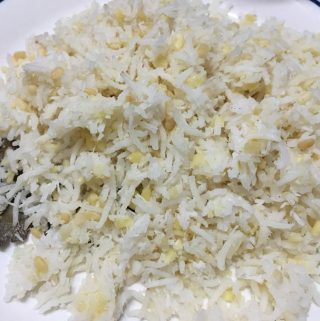 I used little garlic powder to add even more flavor to the coconut rice, you can also use freshly crushed garlic (two to three cloves) instead of garlic powder if you do not have garlic powder at home. So here is how you can make this easy and quick coconut rice using instant pot following this easy instant pot coconut rice recipe. Instant pot coconut rice pilaf/pulao (South Indian style recipe) using white basmati rice is so easy to make and flavorful which can be enjoyed with any vegetarian curry, fresh yogurt, raitha or pickles. Wash the rice and moong dal, transfer it to the inner pot. Add the coconut, garlic powder and enough salt, mix well. Add all the whole spices - bay leaves, cardamom pods, cloves, star anise and cinnamon sticks to the pot. Also add the butter and water, mix everything well. Close the instant pot with lid in sealing position, switch on the instant pot and press manual, and cook in high pressure for 5 minutes. It will take a few minutes until the pressure is built inside the pot and you will need to wait until then, and the pot will display 'On' at this point. When there is enough pressure built up, the pot will display the minutes and starts the cooking. Once the cooking is done, the pot will beep and you can press 'keep warm'. Wait until the pressure is naturally released, this will take another few minutes, and when the pressure is all naturally released, open the pot and stir the rice gently using a spatula or use a fork. Serve the rice hot with any curry or side dishes, pickles, yogurt or raitha as you wish, for a quick and easy vegetarian lunch or dinner! 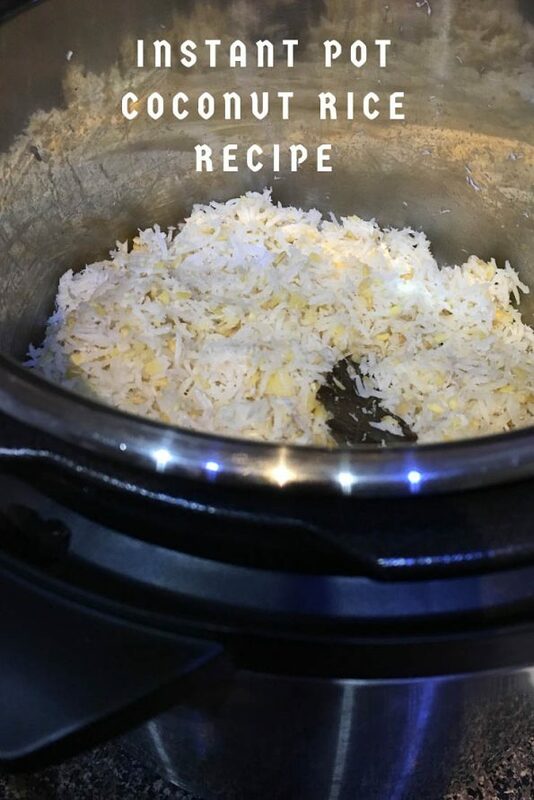 Hope you found this post on easy instant pot coconut rice recipe helpful in making easy, quick and yummy rice for lunch or dinner.